Nordiko were pioneers in the development of Broad Ion Beam process systems for magnetoresistive random access memory (MRAM) applications. The Nordiko Mnem-iX was the first production tool used in the volume manufacture of MRAM devices. Designed for precision deposition of a MRAM module as a backend to a standard CMOS process flow, the Mnem-iX benefits from innovative ion beam process technologies. The magnetic storage element comprises a stack of thin layers including ferromagnetic and antiferromagnetic materials used to form a free and pinned magnetic layer that are separated by a very thin barrier junction. The texture and smoothness of these layers are critical in achieving the best device performance. The low-pressure operation for film deposition combined with the remoteness of the plasma promotes the formation of ultra-smooth films and high integrity thin film interfaces. The unique geometry of the deposition module configuration allows class leading within wafer non-uniformity to be achieved. Precision is paramount and the Mnem-iX has a track record of achievement for MRAM production. Mnem-iX uses a central, industry standard, wafer handling platform. 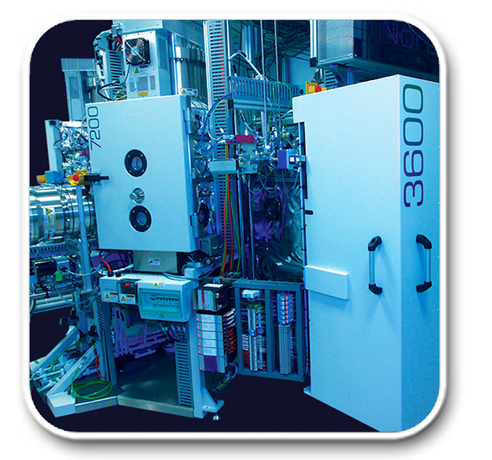 The platform can be equipped with two 3600 or 3800 deposition modules and two smaller 7000 series modules. The latter may be used for wafer pre-clean and surface modification.